What Items Should You Bring With You For Computer Repair/Service? If you are bringing your computer to BWN Computer for repair, please follow the guidelines below. A completed Computer Repair Agreement Form. If you have any CD/DVD’s that came with the computer or software that you would like installed/reinstalled. I will only need the computer tower. Do not bring the keyboard, mouse. 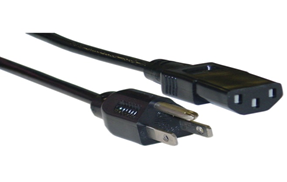 If your power cable looks like the cable picture below, you DO NOT need to bring it with you. Otherwise, if it DOES NOT look like the picture, please bring the cable with you. It is VERY IMPORTANT that you bring the power adapter for your laptop.